The first medals have been doled out at the 2018 Winter Olympics, and the first American has hit the medal stand. That American was 17-year-old snowboarder Red Gerard. Once he was declared an Olympic champion he got the ultimate prize in his sport, the reward for which he has worked so hard: a stuffed white tiger. Your eyes have not deceived you. 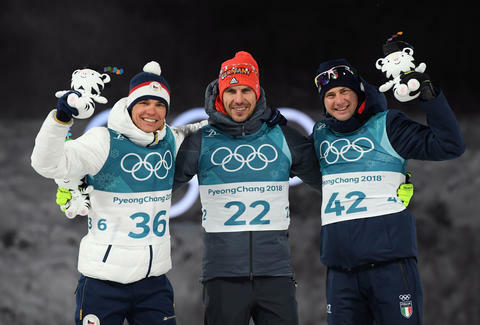 In the moments after being named one of the top-three competitors, athletes are given a stuffed animal at the PyeongChang Games. It's the 2018 Winter Olympics mascot, Soohorang. (Which you can not coincidentally buy for almost $60 a pop. It's a pre-medal ceremony and an opportunity for Olympic synergy!) Olympians such as the biathlon medalists above get a stuffed animal instead of their medal. Medals aren't given out after the event because all of the medals are handed out at the end of each day's competition in a large ceremony at the creatively-named Medals Plaza. In part, the stuffed animals replace flowers, which had long been given out on the podium. Victory ceremony hosts will not be giving anyone flowers in PyeongChang. Athletes just get the animals to start, each of which is adorned with a gold, silver, or bronze hat and a paper flower called an uhsahwa. In a small way, the tradition of flowers remains alive with the dolls. Additionally, the uhsahwa holds historical significance for the host country. According to the host website, the uhsahwa is "a paper flower that was bestowed to those who passed national exams during the Joseon Dynasty (1392-1910)." The 2016 Rio Olympics were the first Games to ditch flowers, citing sustainability concerns. It's a nice gesture toward sustainability, but it's a drop in the bucket when placed next to all the brand new buildings that are often abandoned shortly after the Games conclude. Additionally, at the medal ceremony, each medalist is handed a small carved wooden gift that looks like an open box. The Games' site says the gift is "adorned with mountain scenes of PyeongChang and characters from the Korean Hangul alphabet spelling out 'PyeongChang 2018' in the official Games motif." While the stuffed animal is a little gimmicky and feels like a chance to tell people at how they should go to the Olympics store and buy their own mascot, the wooden boxes aren't for sale online. Maybe they should start giving out some of Yuzuru Hanyu's leftover Winnie-the-Pooh stuffed animals. Check back during the games for all of Thrillist’s continuing Olympics coverage. Think of us like an all-knowing friend watching along with you to answer all the important questions, like how heavy are Olympic medals. We'll explain everything from curling rules and figure skating scoring to what OAR means and much, much more.